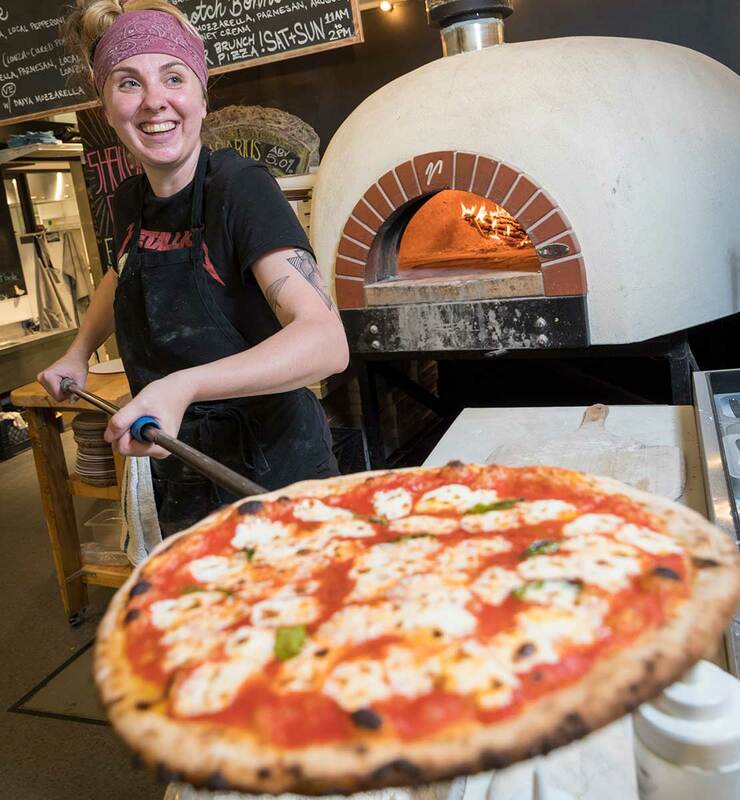 A couple from Williams Township had just finished enjoying a wood-fired artisan pizza and craft beer at Scratch after they picked up pasture-raised beef tenderloin for the weekend grill from Dundore & Heister. Also tucked into their shopping bag was fresh shrimp from 3rd & Ferry Fresh Fish and locally grown vegetables from Highmark Farmstand. It was their first visit to the Easton Public Market, and by their broad smiles and anticipation of other memorable meals at home, it wasn’t going to be their last. “We’ll be back soon,” they said, almost in unison. Opened in March 2016 in downtown Easton, Easton Public Market has quickly become not only a popular stop for city residents and business people downtown, but another must-see destination for the Lehigh Valley and beyond. As soon as you enter the glass doors from Northampton Street, you’re welcomed back to a time before bar-coded packaged and processed foods—a time when people would talk with vendors and smell, inspect, and sample their off-the-farm food before bringing it home for the dinner table. Nineteenth-century brick walls, fluted columns, and original, time-patinaed wood floors echo back to when the 300 block of Northampton Street represented the heart of Easton’s retail district, with Rader’s Dry Goods and H.L. Green’s Department Store among its early occupants. “The idea for the indoor market came out of the redevelopment activity in Easton and the Easton Farmers’ Market, which has grown wildly in recent years as a resource for people who are looking for locally-sourced food and produce,” says Megan McBride, market district director. Looking to satisfy a growing demographic of young families and empty nesters in need of more than the Saturday farmers’ market, the city conducted a feasibility study in 2007 in conjunction with Easton’s Nature Nurture Center, which is focused on getting the community talking and thinking critically about the local environment, to see if there would be support for a food market or co-op. 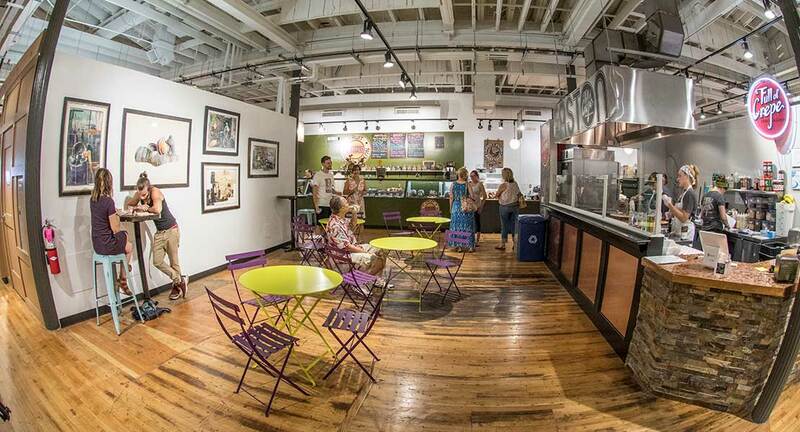 Easton Public Market is a perfect fit for diverse tastes, needs, and schedules. It houses 14 vendors with choices spanning freshly roasted coffee (including iced coffee on tap! ), falafel, olive oil blends, ribs, crepes, smoked brisket, and pizza. There’s even a Community Room for meetings, mixers, and private events. Families enjoy the casual, open atmosphere and bring their kids to the market after visiting Crayola Experience just a block away, which has helped bring lunch traffic to the market. Business people drop in regularly for lunch meetings, while remote workers and the mobile office community are coming to the market for a welcoming outpost with free Wi-Fi, good coffee, and the monthly Easton Tech Meetup. The mayor says that most of the people who visit the Farmers’ Market on Saturday also stop at the Public Market. “People are coming to our city from a 50-mile radius; you wouldn’t have seen that 20 years ago,” he says. 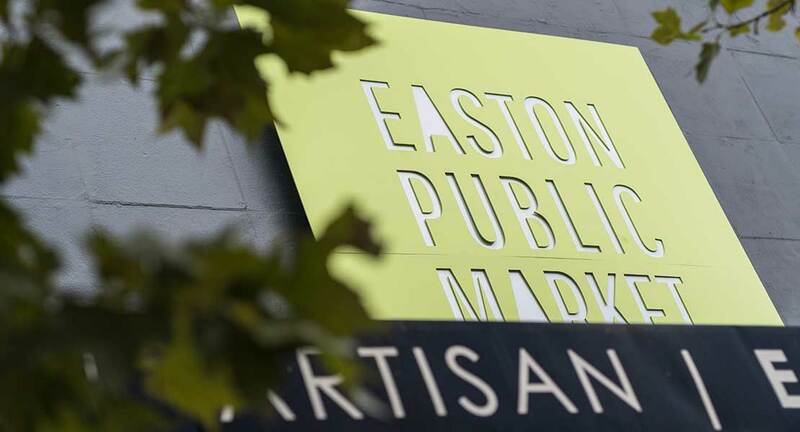 The Greater Easton Development Partnership plays a strong role in this expanding ecosystem with its Easton Main Street Initiative and Easton Ambassadors programs, in addition to running the Easton Farmers’ Market, Easton Public Market, and PA Bacon Fest. “We’re lucky to have a very supportive mayor and City Council who invested in this project from the start. Without that, the project wouldn’t have been possible,” says Jared Mast, executive director of the Greater Easton Development Partnership. 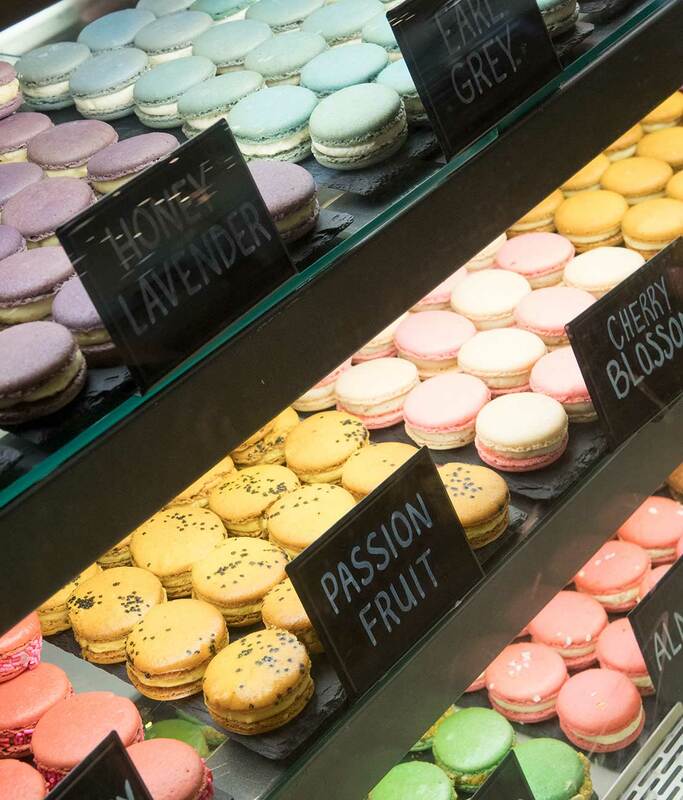 The market also is building upon Easton’s role as a culinary center in the Lehigh Valley. “With all the great restaurants, the Easton Farmers’ Market, and a growing number of food entrepreneurs, the Easton Public Market represents a natural expansion on that,” Jared says. “It’s not an accident that Oak Steakhouse opened next door to the market and that Easton continues to grow around craft food and beverage. Tod Auman, owner of Dundore & Heister, based in Wyomissing, Berks County, says it was Easton’s energy that motivated him to open his second organic, antibiotic-free meat store in the public market. 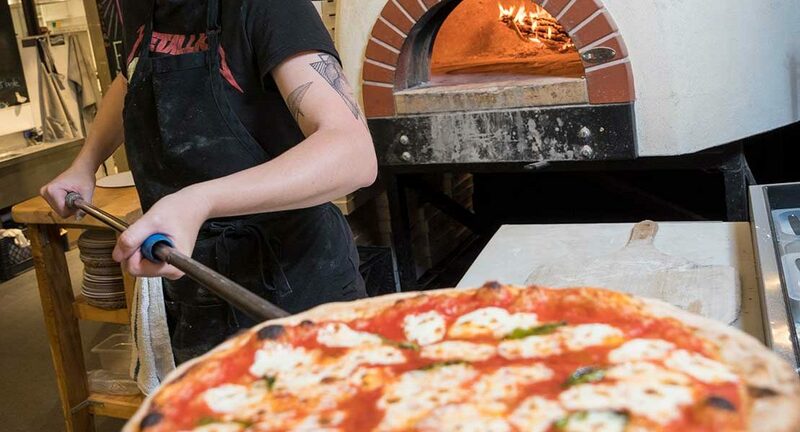 “We looked at a lot of different locations, from Lancaster to Philadelphia, but I was so struck by the sense of food entrepreneurism and sense of civic pride in Easton, which stood out compared to other places we considered,” he says. When you visit Easton, “you can touch the past. The city’s leaders have done a great job keeping the historic buildings around and not taking them for granted,” Tod says. Easton Public Market, which attracts 5,000 people a week, has also made a mark on the local economy by creating 70 jobs. The Highmark Farmstand, which is operated by the market, procures 42 percent of the products purchased for resale from local farms and food purveyors; 21 percent comes from regional farms and purveyors, Megan notes. Some new additions coming this fall include a series of Dine with the Chef nights, sponsored by Morris Black Designs and featuring Bayou Easton, and Chile Pepper Fest on September 16, which will span the entire Easton Market District. 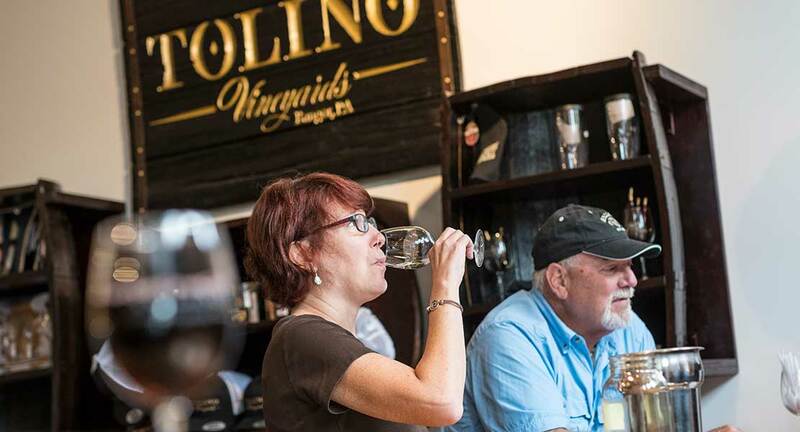 And there’s live music Friday and Saturday nights from 6-9 presented by Scratch and Tolino Vineyards.